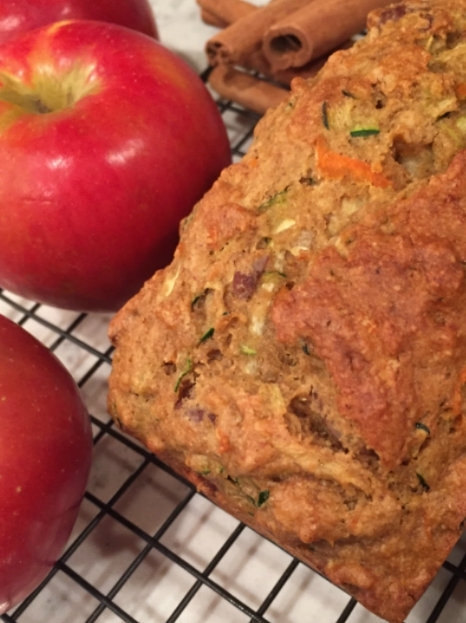 This quick bread is a great way to use up some of the last zucchini of the summer, and mixes in carrots and apple, making a nice tender crumb. 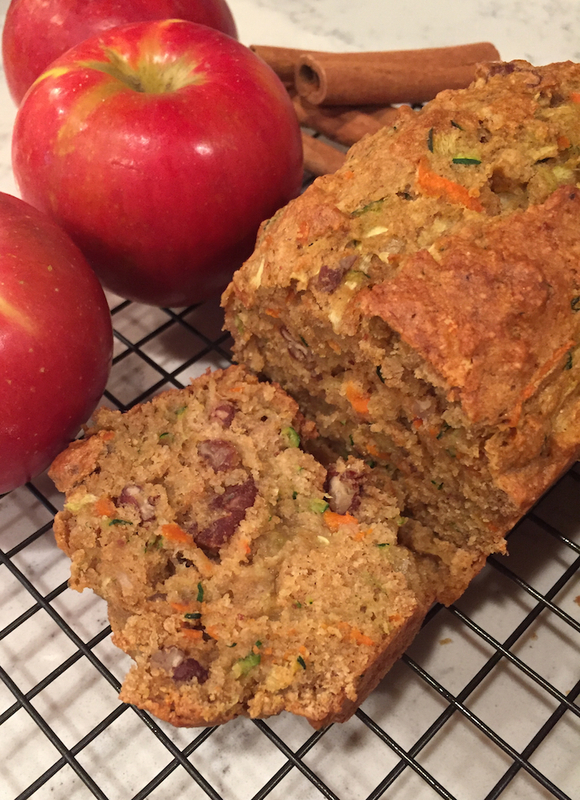 I left out the chocolate chips to keep this more of a breakfast bread, and it’s just lightly sweetened. If you prefer a sweeter bread feel free to add in the chocolate chips, or increase the sugar by a 1/4 cup. I also used white whole wheat flour to increase the amount of fiber, and the crunchy pecans add a little protein and some healthy fats. 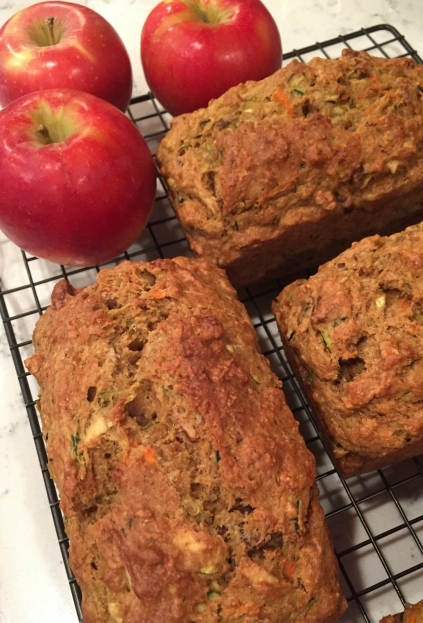 Pair this bread with a cup of coffee or tea and you have a mighty fine morning or afternoon snack. Preheat oven to 350ºF. Grease 4 mini loaf pans or 2 regular loaf pans with cooking spray. In a large bowl, sift together flour, baking soda, baking powder, salt, cinnamon, cardamom, all-spice, nutmeg, and ginger together. In a separate bowl, whisk together the eggs, sugars, oil, applesauce, and vanilla extract. Mix the wet ingredients into the dry, then fold in the shredded zucchini, carrots, apple, pecans, and chocolate chips (if using). Divide the batter between your prepared baking pans. Bake for 40-45 minutes for the mini-loaves, and about 60-75 minutes for a regular sized loaf, they’re done when a toothpick inserted into the center comes out clean. Let cool for 5 minutes on a wire rack, and then turn out the loaves on a wire rack to cool completely.